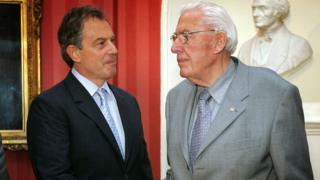 Former Prime Minister Tony Blair has denied a claim that UK security services had bugged a phone belonging to the late DUP leader, Ian Paisley Sr. The claim was made by John Prescott, who served as deputy prime minister during Mr Blair's tenure in Number 10. Writing in the Sunday Mirror, Mr Prescott alleged that Mr Blair told him about the phone tapping in 2005. But Mr Blair's spokesperson said the story was "wrong" as the former PM had not authorised the bugging of any MP. Mr Paisley Sr, a former first minister of Northern Ireland, died in 2014. He was the founder of the Democratic Unionist Party and served as MP for North Antrim for 40 years. Following the weekend report, his son, Ian Paisley Jr, said he would raise the bugging allegation in parliament. UK security services are not allowed to intercept MPs' communications, under a ruling known as the Wilson Doctrine. It was introduced in 1966 by the then Prime Minister Harold Wilson. The ruling also meant that in the event that an MP was tapped, the prime minister was required to tell parliament. Writing in his Sunday Mirror column, Mr Prescott said: "In 2005, when I was deputy PM, I was told by Tony Blair an MP had been tapped in the past without parliament being told. "I asked him who it was and he told me the MP was the Rev Ian Paisley. "Downing Street had been told by the interception of communications commissioner, who wanted to name Paisley. "Tony asked me to discuss the Wilson Doctrine with the speaker of the House of Commons. "I never told him (the speaker) that an MP had been tapped, or that it was Paisley." Mr Prescott declined to be interviewed by the BBC. But in a statement to the corporation on Monday, Mr Blair's spokesman said: "This story is wrong. "No authorisation for the phone tapping of a member of parliament was given during Mr Blair's time as prime minister. "It may be a confused account of the discussion of the Wilson Doctrine in Cabinet - something which was public at the time - which dated back to the 1960s."